My brother wasn’t a registered organ donor, but he did make his wishes to be an organ donor to everyone in his family. The evening of his 50th birthday party, he rode off on his Harley Davidson with a group of his friends. A long-time rider, he chose not to wear a helmet. About a mile down the rode, his motor cycle crashed and his face hit the pavement….hard. He was flown to a Level 1 trauma center where he was put on ventilation support (sometimes called life-support). After many weeks and countless brain scans, our doctors told us the bad news. My brother likely died that fateful night, and the ventilation support was doing nothing more than making his lungs and heart function mechanically. They recommended removing him from the ventilator, leaving behind his wife and 2 children ages 14 and 12. In order to bring some amount of good from this terrible accident, we decided to donate his organs in accordance with his verbal wishes. His donations gave more than 25 different people the lifesaving organ and tissue transplants they needed for a second chance at life. Later, we received hand-written thank you letters from the recipients. Each letter would bring us to tears as we read about how much the gift of life meant to each transplant recipient. Some were children. Some were teenagers. Some were young fathers and mothers who were grateful that they were now offered an opportunity to see their own children grow up. Lots of love & admiration to you and your wonderful family and Brother. Thank you for sharing. 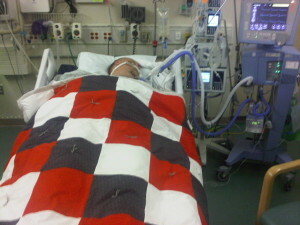 Our 23 year old son Tyler was also on life support after he failed to wake up that fateful morning in 2011. He to, while not a registered donor, had told us he would absolutely donate if anything ever happened to him. There is a comfort knowing so many people were helped and meeting his heart and kidney recipients was priceless. It really does make a difference in so many lives. Sorry for your loss…a fellow Harley rider.